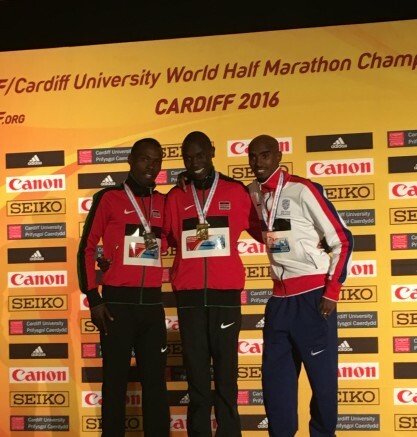 26th March 2016 – In an eventful and memorable race in Cardiff, Mo Farah (GBR) collected Great Britain’s first male medal in this race since 1993. The moment the starting gun fired there was drama as defending champion Geoffrey Kamworor slipped and fell to his knees which resulted in him losing ground. However, by the end of the first mile he was back with the lead group and pushing the pace with teammate Bedan Karoki. Mo chose to sit at the back of the lead pack but the spread of this group showed the pace was fast. Given the cold and blustery conditions quite how fast was incredible. Passing 5k in 14:10, 10k in 27:59 and 15k in 41:41 the Kenyan duo of Kamworor and Karoki broke clear. Mo was running his own race and his split of 42:03 at 15k set a new European record yet he still found himself down in sixth place. Once again demonstrating his ability to really dig in though, as the conditions worsened with rain drenching the runners Mo got himself back in contention for a medal. Entering the last half way it was clear this was to be Kamworo’s day and Karoki would take the silver, but roared on by the British fans lining the streets Mo sprinted down the finishing straight to take a hard earned bronze and dip inside 60 minutes with a time of 59:59. Despite being disappointed not to take the win, Mo acknowledged that the better athlete won the day but all roads lead to Rio. He is motivated to go away and work hard again now to get himself in the best shape he can.